1-OWNER, VERY LOW MILES, PERFECTLY CLEAN CARFAX, 5.3L V8 ECOTEC3 ENGINE, 6-SPEED AUTOMATIC TRANSMISSION, 2-SPEED AUTOTRAC TRANSFER CASE, AUTO LOCKING RR DIFFERENTIAL, 3.08 RATIO REAR AXLE, TRAILERING EQUIPMENT PACKAGE, EZ LIFT AND LOWER TAILGATE, LED W/SIGNATURE TAILLAMPS, LED FRONT FOG LAMPS, REAR BUMPER CORNERSTEPS, REMOTE VEHICLE START, POWER ADJUSTABLE PEDALS, DRIVER INFO COLOR DISPLAY, 110 VOLT AC POWER OUTLETS, BACKUP CAMERA, USB PORTS, BLUETOOTH. OPTIONS INCLUDE THE FOLLOWING: ALL TERRAIN SLT PREMIUM PACKAGE (4-INCH BLACK ROUND ASSIST STEPS, 20-INCH ULTRA BRIGHT M/C ALUMINUM W/PAINTED ACCENT WHEELS, FRONT AND REAR PARK ASSIST, HEATED STEERING WHEEL, POWER SLIDING REAR WINDOW, FULL LED HEADLAMPS - $2,880), ALL-TERRAIN PACKAGE (Z71 OFF-ROAD SUSPENSION PACKAGE WITH MONOTUBE RANCHO SHOCKS, SPRAY-ON BED LINER, FLOOR LINERS, FRONT AND REAR BODY-COLOR BUMPERS, BOSE AUDIO SYSTEM, FRONT FULL FEATURE LEATHER APPOINTED BUCKET SEATS, CENTER CONSOLE, FLOOR W/USB PORTS AND WIRELESS CHARGING - $2,225), CRIMSON RED TINTCOAT - $495, GMC INTELLILINK AUDIO SYSTEM W/8-INCH DIAGONAL COLOR TOUCH & NAVIGATION - $495, TRAILER BRAKE CONTROLLER - $275, ALL TERRAIN TIRES - $200. THIS TRUCK HAS JUST OVER 6,700 MILES ON IT! ORIGINAL MSRP WAS $52,095! 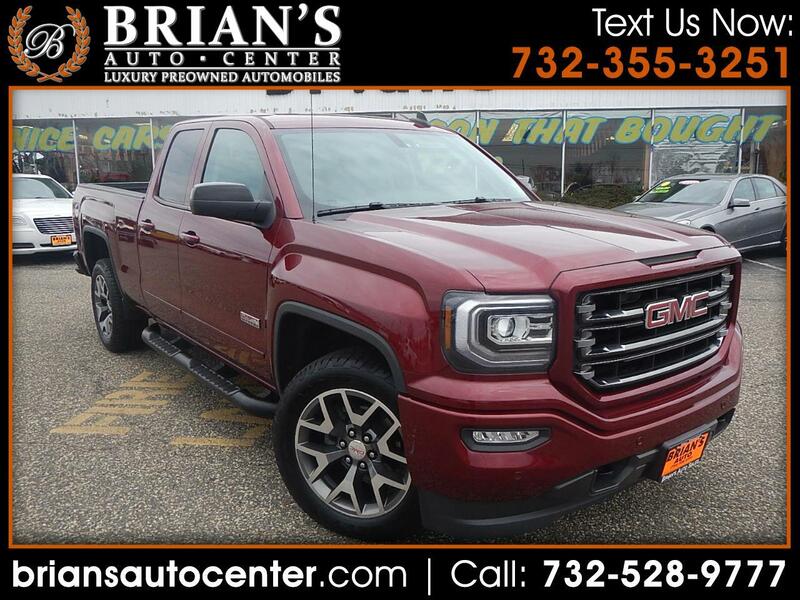 GIVE US A CALL AT (732)-528-9777 TO LEARN MORE ABOUT THIS ABSOLUTLEY GORGEOUS TRUCK!